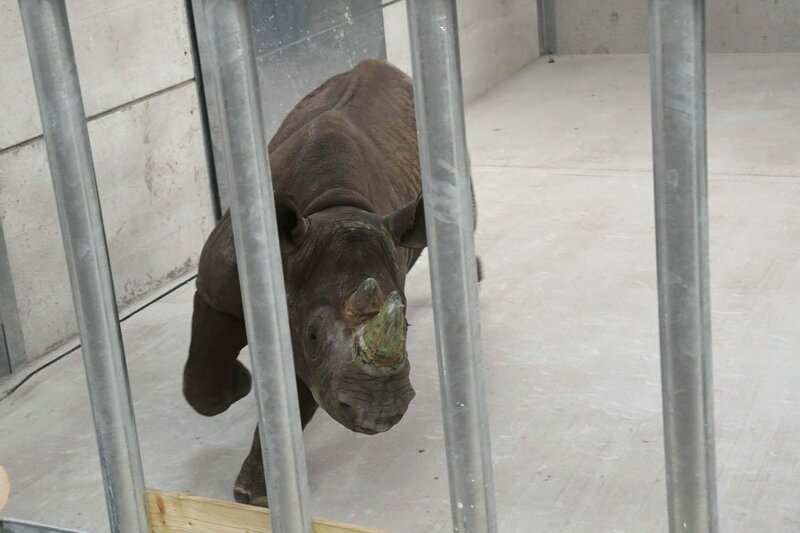 Award-winning Yorkshire Wildlife Park yesterday welcomed two critically endangered black rhinos. The two-year-olds – Hodari and Dayo – arrived at YWP just after 8am in a truck after traveling 800 miles from their birth place of Berlin Zoo. The pair, each weighing about 750 -880 kg (when mature they will weigh up to 1500 kg) took the overnight ferry from Hoak van Holland to Killingholm before embarking on the final leg of the journey to Yorkshire by road. The young rhino were very lively on arriving at the Park and it was a delicate operation to manoeuvre the crate into position and to release the young rhino into their new purpose built house which measures 16 metres by 35 metres, They will settle in here for a few days and get to know the rangers who will be caring for them before venturing out into their extensive reserve in the Africa section of the Park. 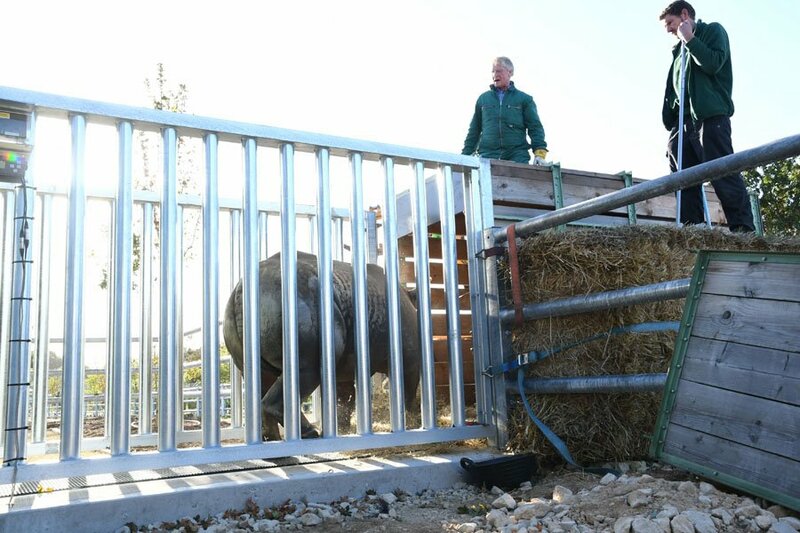 “We are really excited about the rhinos arrival as they are so critically endangered in the wild. It is great that we are now part of the European breeding programme and will be working tirelessly to raise funds and awareness for black rhino in the wild as well. 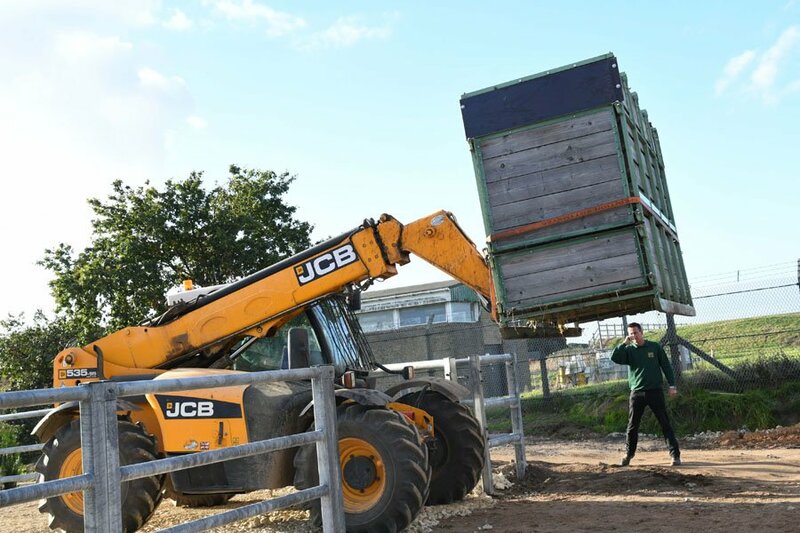 Their arrival is another triumph for Yorkshire Wildlife Park, which is committed to conservation and welfare. Black rhinos were almost extinct in 2011 until concerted efforts around the globe brought them back from the brink and numbers have grown to around 5,000. The rhino population declined by 96% from 65,000 in 1970 to less than 3,000 by 1993 from a devastating period of poaching for their horns which are used to make ornamental crowns, cups and ceremonial daggers as well as for herbal medicine. The black rhino, which used to be native across wide areas of Africa, can measure 6ft tall at the shoulder and weigh in at 3,000lbs, roughly the same weight as a family estate car. YWP is only the seventh zoo in the UK to have the species and will soon be a star attraction in the African reserves, which gives visitors an amazing walk through experience with views of some amazing animals including the Eland Antelope, endangered Grevy’s Zebra, Lechwe Antelope, Ostrich and some other visitor favourites – the Giraffes, Behansin, Palle, Jambo and Jengo. The park brings visitors almost face to face with some of the world’s most rare and beautiful animals including Amur Leopards and Tigers, Lions, Squirrel Monkeys, Anteaters, the country’s only four polar bears and many more. It is the perfect place to come for a fun packed family day – with a weather proof Monkey Play House offering adults the chance to relax in the warm 120 seater café while children enjoy three levels of play equipment – in full view of the baboon reserve through a glass wall. There are ranger talks and feeding times throughout the day and plenty of play areas for children as well as shops and cafes.